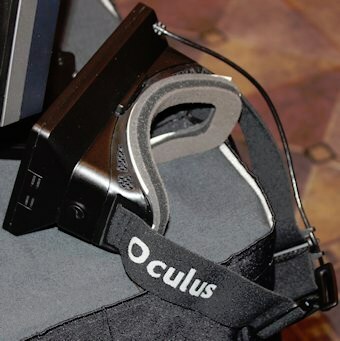 Scott Wasson from The Tech Report got to test the Oculus Rift virtual reality headset at a pre-CES event last week and writes the device is freaking amazing. He was impressed by the impressive game immersion, with a true and robust sense of depth, without suffering from flickering or momentary disorientation and focus problems as with most stereoscopic 3D technology. You can read his report over here. The depth was there immediately, and I soaked in the tangible sense of reality as the Oculus guys explained that they had built in much more separation than most stereo display systems. The result is that objects in the virtual world—in this case, an Unreal engine-based demo called "Epic Citadel"—look like real, three-dimensional objects, not just a cardboard-cutout knight standing in front of a cardboard-cutout flag, as in most stereo display schemes. Having a truly separate image for each eye allows for more depth, which works wonders. Depth is only part of the experience, though. Much of the magic came from the fact that the headset was tracking even the subtlest movements of my enormous noggin and adjusting the field of view to compensate. You can look side to side, look up, look down, even bend backwards and sideways to look at the sky over your shoulder, and you'll see the proper portion of the game world in front of you. If you've tried VR headsets that attempt this feat in the past, you'd rightly be skeptical about this aspect of the experience. The thing is, the Rift tracks your movements so quickly and fluidly that it actually works, like gangbusters, tricking your brain into accepting its alternate reality.